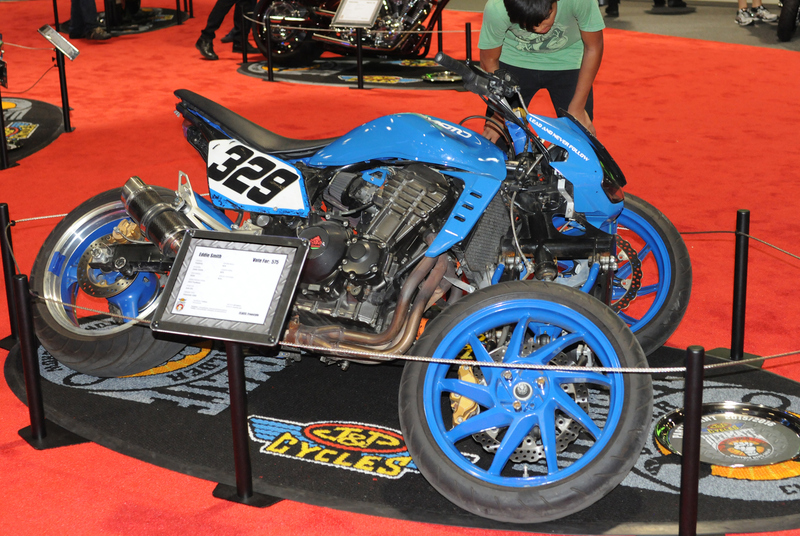 Long Beach, CA - Nov 19-21st 2015 -The annual Advanstar produced (IMS) International Motorcycle Show sponsored by Progressive Insurance makes its way across America every winter, with 3-day weekend stops in every major city. 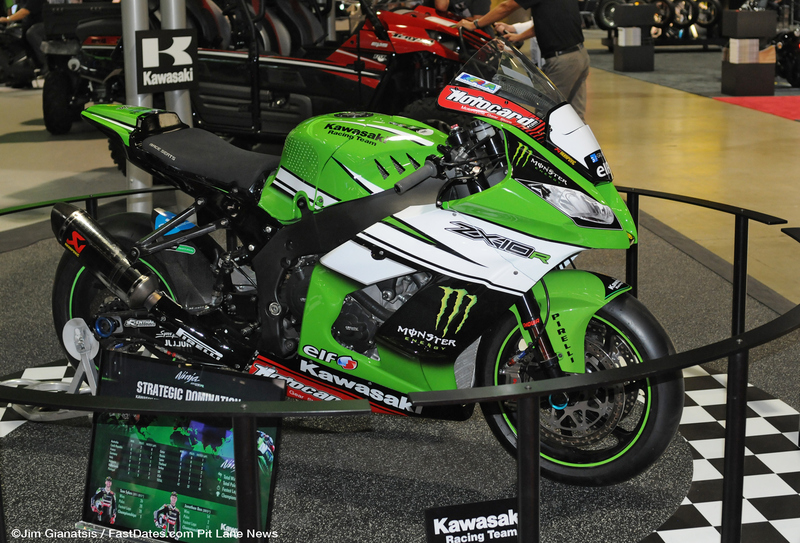 It's the perfect time for motorcycle enthusiasts to come in from the cold and see the latest new 2015 bike offerings from all the major motorcycle manufacturers and fill out your Christmas wish list. 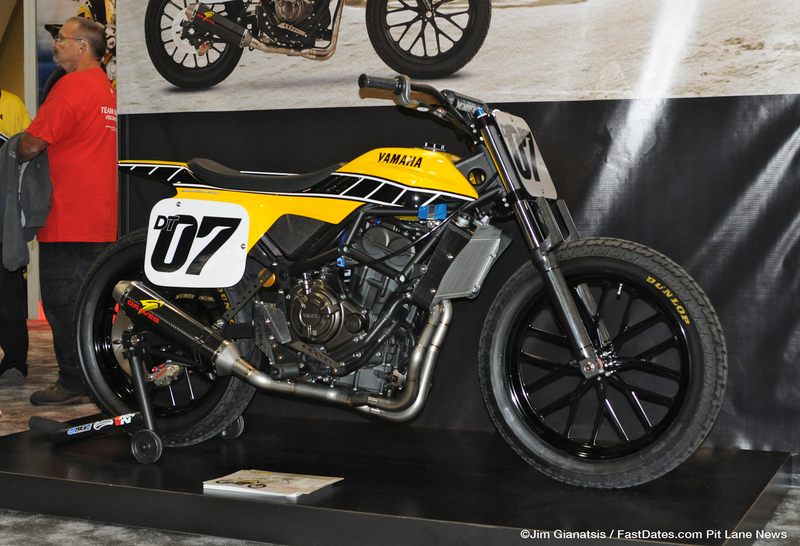 Every year following the IMS Show at Long Beach, I ask many of Los Angles motorcycle buddies if they went to this year's Show, and from most part i get the reply - "No, I didn't go, I heard it wasn't very good this year and there were no crowds, so i saw no reason to go"
The simple fact is, IMS is always a really good Show. 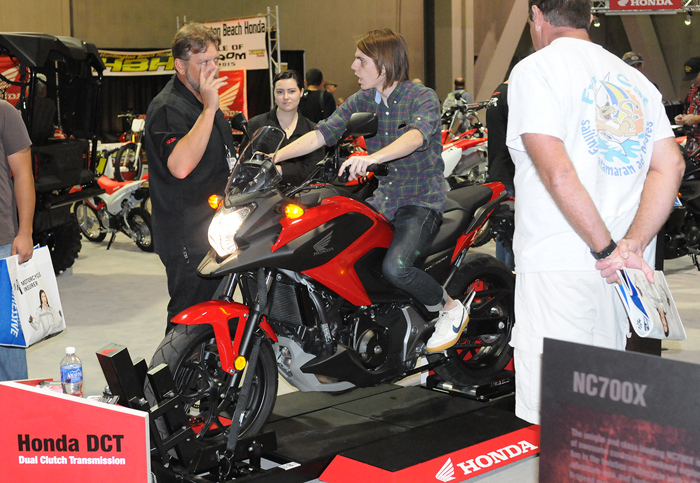 I easily enjoy spending 6-7 hours there walking the entire floor to see all the new bike displays and vendors, the attractive spokesmodels, and meeting with my friends in the industry. 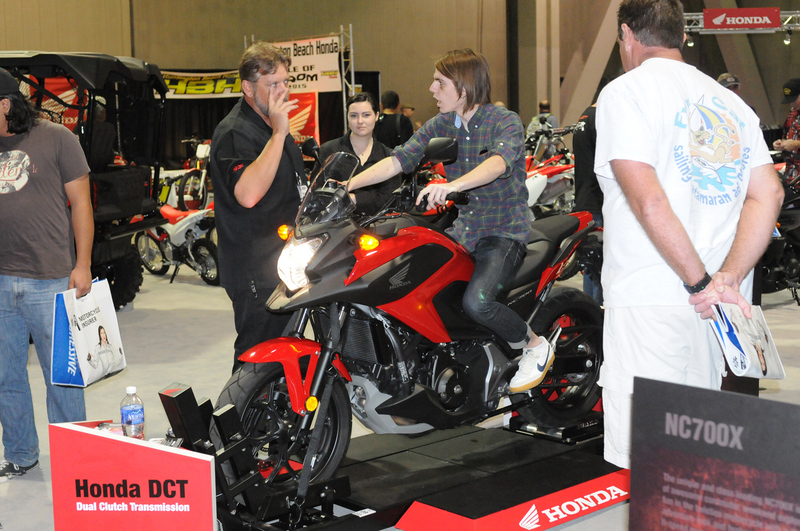 Since the Economic Collapse in 2008 downsized the Motorcycle Industry, sure the crowds are smaller. Advanstar always advertises weekend crowds at an inflated 70,000 to justify the IMS Tour across America for the motorcycle manufacturers to attend. Where as we really know and can count about 8,000 attendees for the weekend in Los Angeles is probably a more realistic figure. The weekend attendance numbers may be higher back East where motorcycle fans are not as hard to please and don't have our beautiful sunny days to go riding instead. But smaller crowds not getting in our way just makes it better for us who do go, so we don't have to wait in line to sit on bikes and talk tot he beautiful spokesmodels or find a manufacturers' staff to answer our questions. The Ducati Hyperstrada is a do everything motorcycle for around town riding and canyon bashing, to attach on a set of saddlebags and go touring. 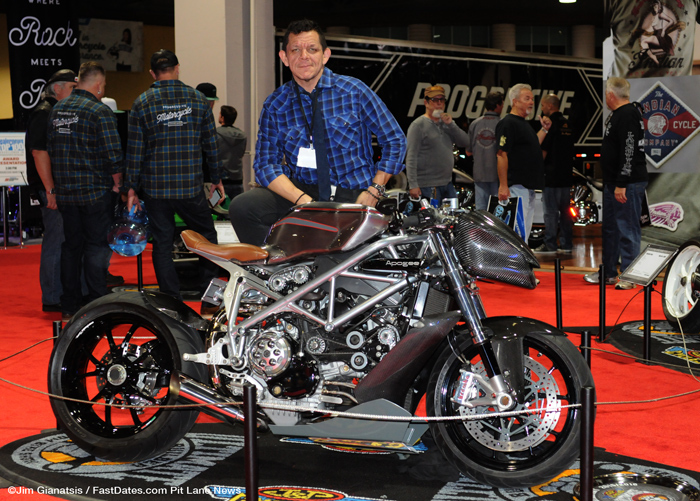 Above: Ducati's new bike introductions for 2016 included a newly redesigned model X Diavel V-twin with the new variable cam Testastretta motor, more power and torque, and updated styling. Other updates included a smaller, more affordable entry level models like the 399cc Scrambler Sixty2 model, and a larger displacement base model 959cc Panigale Superbike. 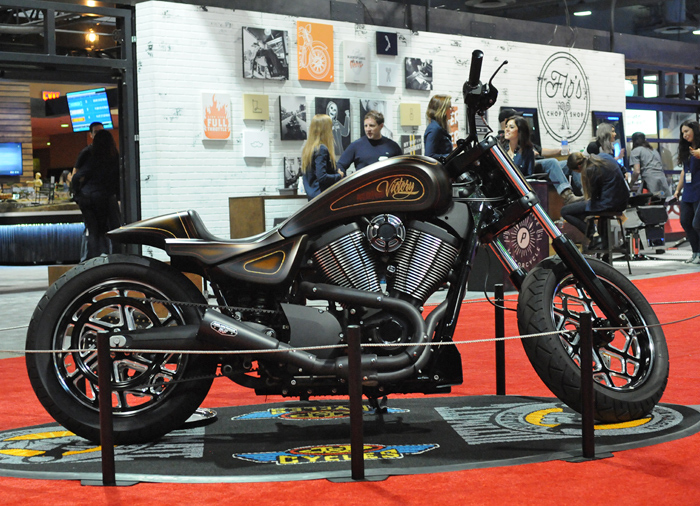 Indian Motorcycles now offers a full line of Road and Touring bikes that rivals Harley-Davidson, and surpasses Harley in design and technical advances. 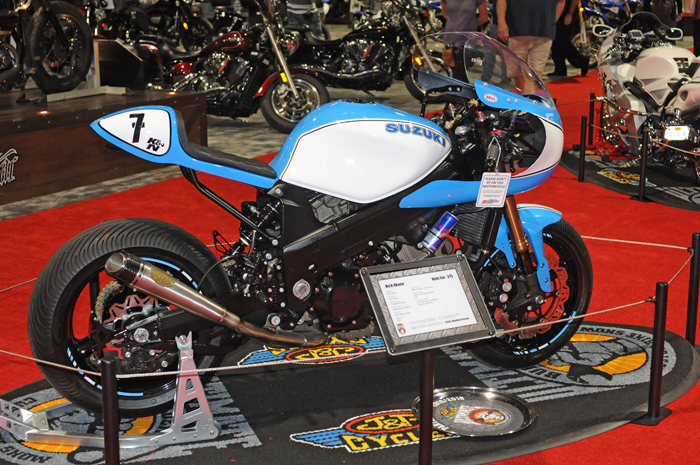 Nick Kane at K&N Filters showed off this beautiful retro styled Suzuki TL1000 V-Twin track bike. 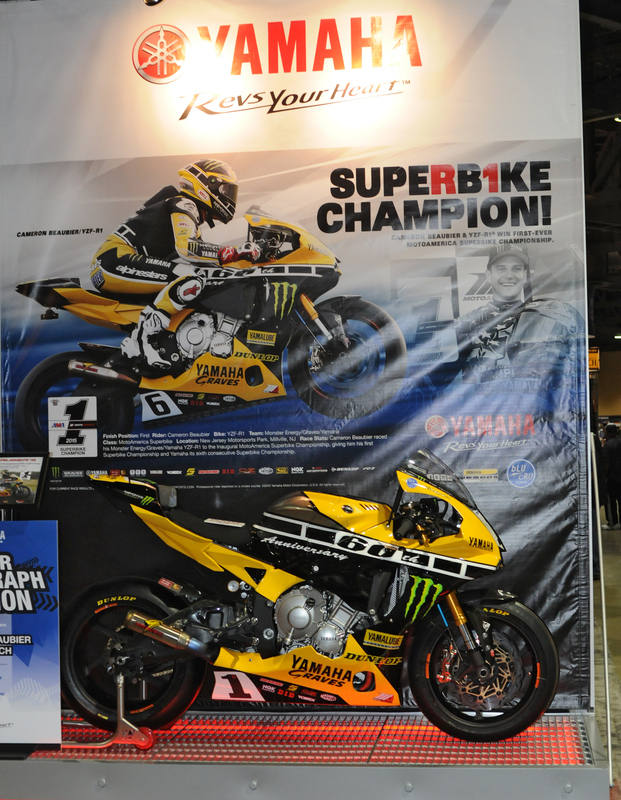 Yamaha USA always gets our attention for putting on the best display of any of the Big Four Japanese manufacturers at the IMS Shows, and for being more deeply involved in the racing and custom bike scene than any other manufacturer. 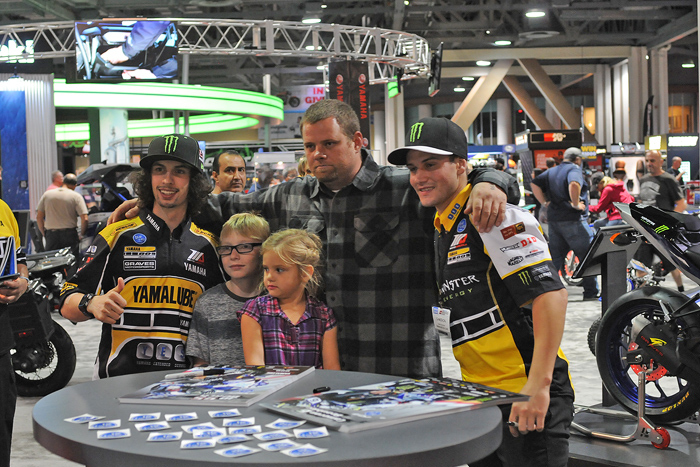 This year was no exception with an exciting a display of racing bikes and riders featuring Jorge Lorenzo's 2015 MotoGP World Championship winning M1 (above #99), and Cameron Beaubier MotoAmerica AMA National Superbike Championship winning Graves Yamaha M1 with Cameron in attendance with the Monster Energy Spokesmodels to meet the fans and pose for photos. The Yamaha DT07 is a dirt track concept bike using Yamaha's new R7 700cc parallel twin engine. 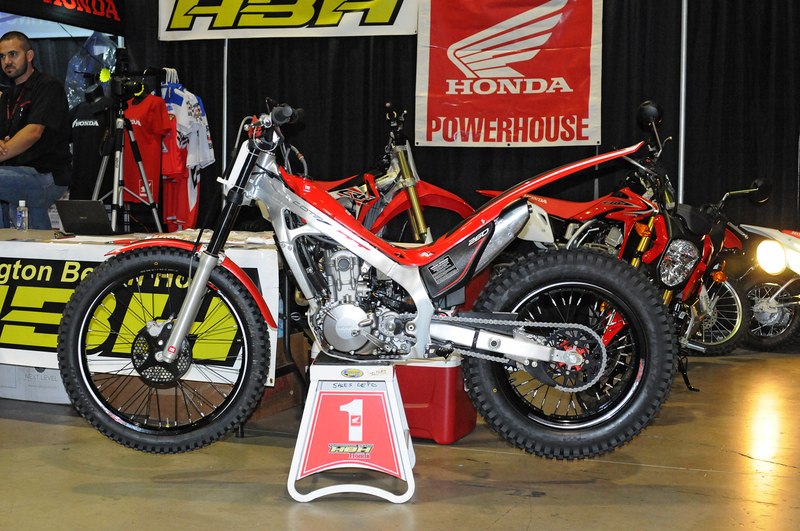 The rolling chassis kits are already available in the aftermarket to build the bike for AMA Dirt Track Racing. Yamaha's 2015 AMA Roadracing National Champion's JD Beach / 600cc Supersport and Cameron Beaubier / 1000cc Superbike signed autographed posters and posed for fan pictures in the Yamaha display. Honda had their overpriced $170,000 MotoGP Replica the RSV4 on display. 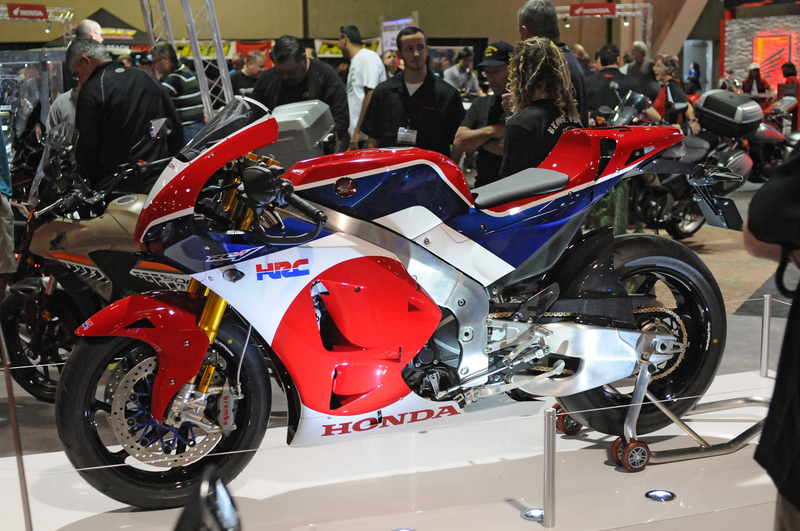 Why they didn't make this the new generation CBR1000 to homologate it for World Superbike racing we will never know. But in 2016 winter testing, Ten Kate Honda's new Superbike rider Nicky Hayden has already broken the track record at Jerez, Spain to show the old goats (both Nicky and the CBR1000) may still prove to be more than coemptive in the upcoming 2016 season. The IMS Show Tour across America has survived, in part, despite the Economic Collapse of 2008 which devastated the American motorcycle industry, thanks to new title sponsors like Progressive Insurance. 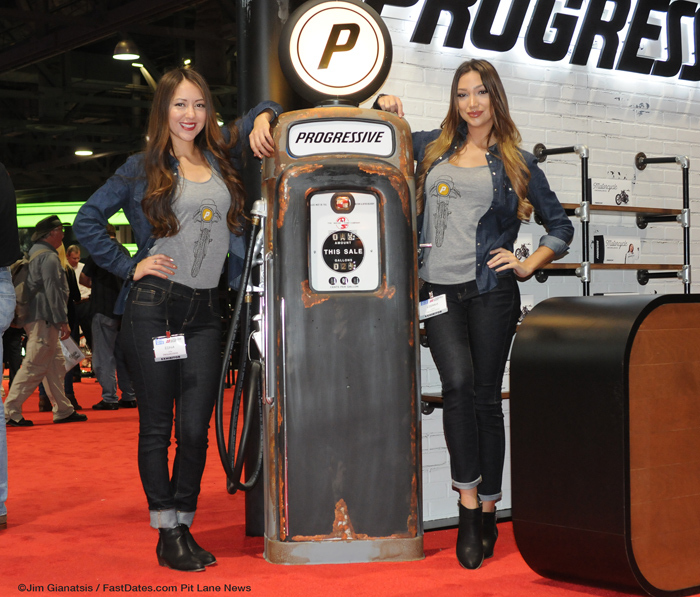 The Show Tour features a big Progressive Insurance display with beautiful spokesmodels that will talk to you and pose for photos like this lovely girl. No matter how much I hate the non-stop Progressive Insurance on TV and in magazines, with their horrible spokesmodel Flo, and their inflated insurance rates to fun their multiple hundred million dollar advertising campaign, thankfully they are putting music of back into the American motorcycle industry by sponsoring Shows like IMS and many racing Events. One of Honda's new bikes for 2016 is this NC700X sport touring bike featuring the first-ever twin clutch transmission for motorcycles (see below). 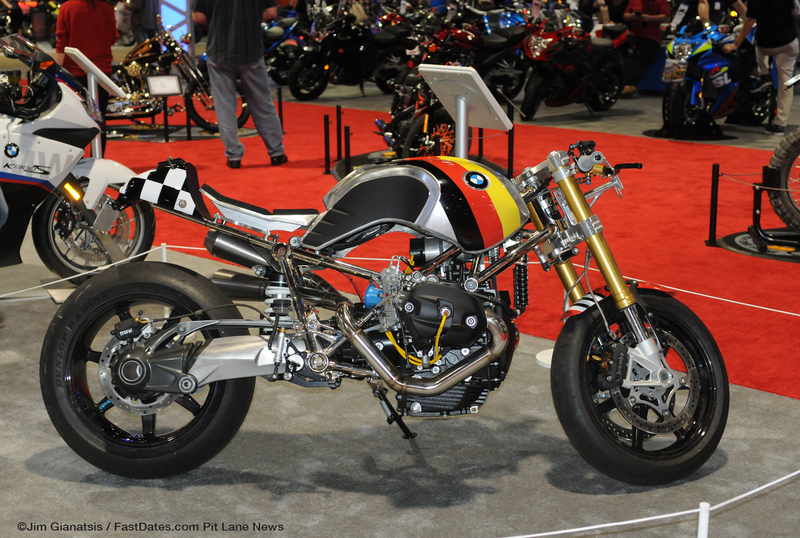 The Twin Clutch allows 1st gear starts without engaging a clutch for smooth getaways. particularly on a hill in off-road riding conditions. And it prove smooth up and down gear changes without the hand clutch. 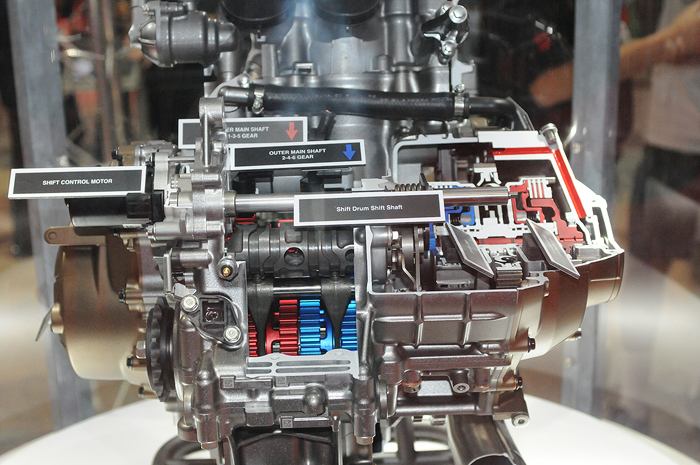 In the cut-away engine display below the Twin or Dual Clutches are show in Red and in Blue, with the related gears they operate in the transmission. 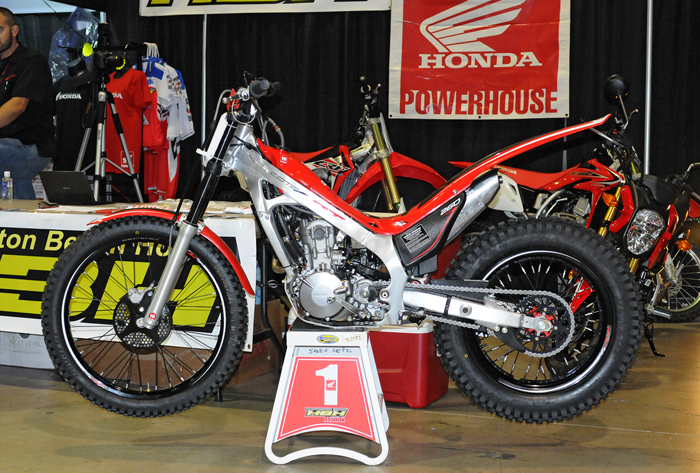 Like an unwanted child, next to the American Honda display was this local dealer selling this beautiful street legal Montesa Trials Bike featuring a Honda 4-stroke power train. One of the many unique motorcycles in the Ultimate Builder Custom Bike Show which displays bikes in the middle of the spectator isle at each IMS Show stop, was this modified Yamaha sportbike with a leaning action design in the front suspension. We have no idea how well it works, bet it sure was a Show stopper for spectators. One of our favorite dealers,and possibly the smartest, Tom Hicks of Southern California Motorcycles was on hand at IMS Long Beach throughout the weekend with many of his store employees who were working the major Manufacturers' Displays to help drive interested buyers to his store. 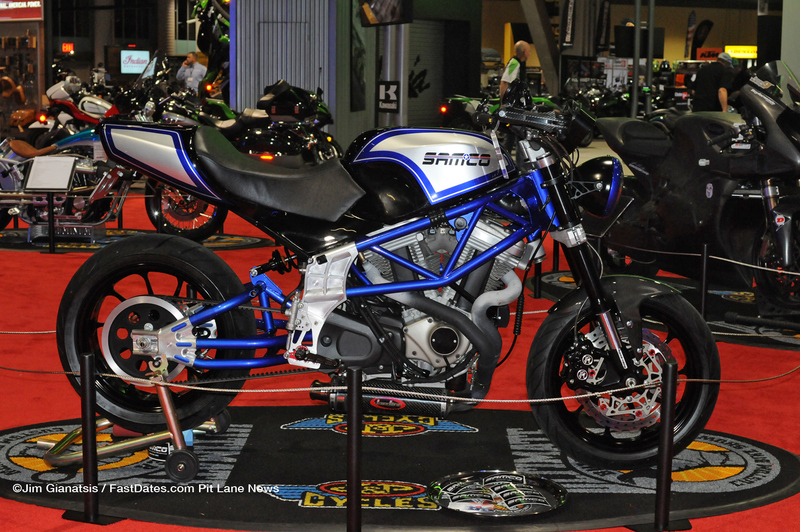 Advanstar, producers of the IMS Shows actually contacted me 6 years earlier when their attendance numbers were dropping off because their shows had become stale, under the pretense to purchase / partner with me and my LA Calendar Motorcycle Show. 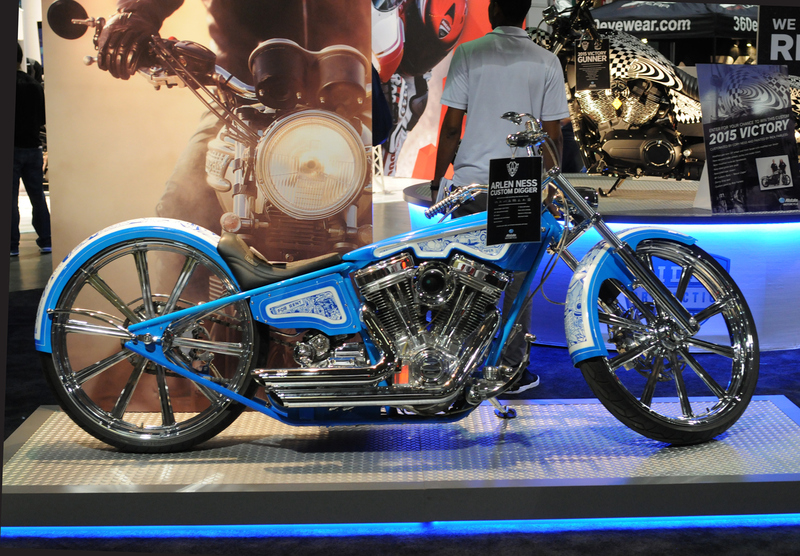 The plan was to bring all the successful elements of the Calendar Show - our Calendar Bike Building Championship, Bike Builder Seminars, Calendar Girl Music and Calendar Kittens to the IMS shows. But once I provided with all the entertainment and production details of the Calendar Show, they gave us an insulting low-ball,l buy out option and copied all the Calendar Show's popular features. Now the IMS shows all feature a custom bike contest display, live music entertainment (including a girl fronted rock band at Long beach this year), and IMS spokes models at the event entrances, and of course all the bike manufacturer's spokes models featured throughout the IMS shows. 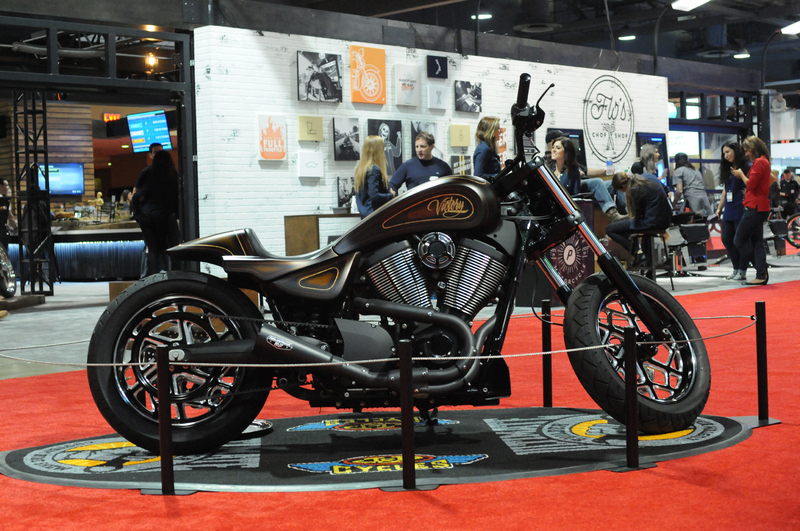 Having been a Victory dealer for many years now, Arlen Ness Motorcycles had a couple of really impressive custom Indian motorcycles (above and Below) entered Ultimate Builder Custom Bike Show. 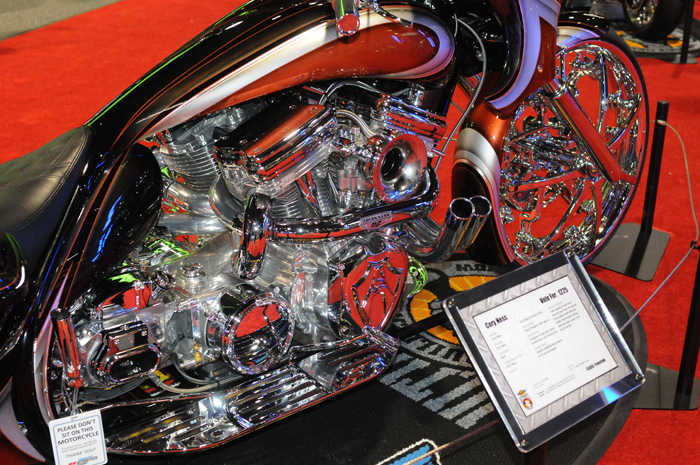 The full-on custom Bagger below needs you to look twice inside all the polished aluminum and chrome to realize that is not a mirror image, but two Indian V-twin engines sharing a common crankcases to make which is essentially a V-4 motor . This bike could easily have cost $250,000 to build. 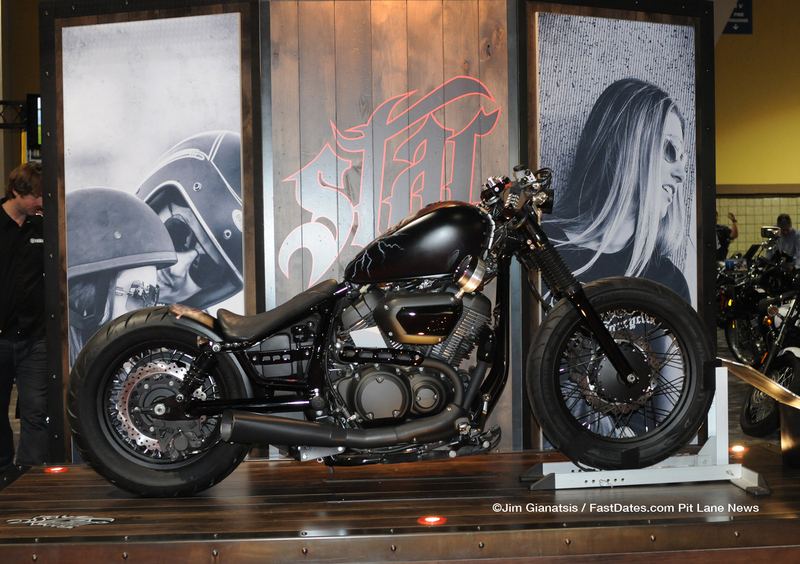 This very tastefully customized Victory was in the Ultimate Builder Custom Bike Show. 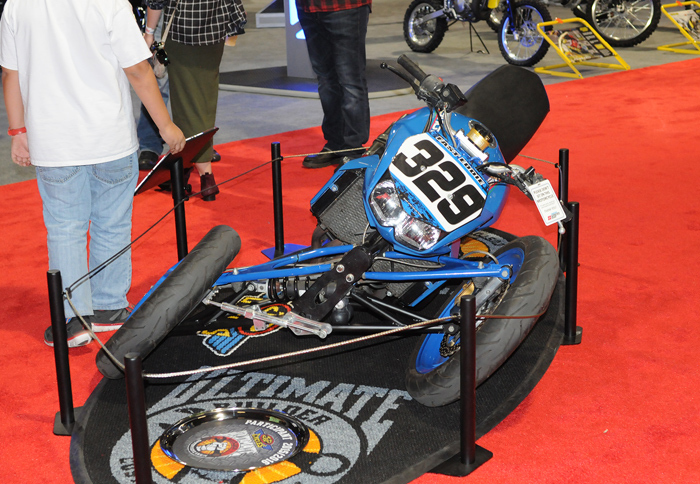 Ultimate Builder Custom Bike Show with a modified Yamaha sportbike with a leaning action design in the front suspension. 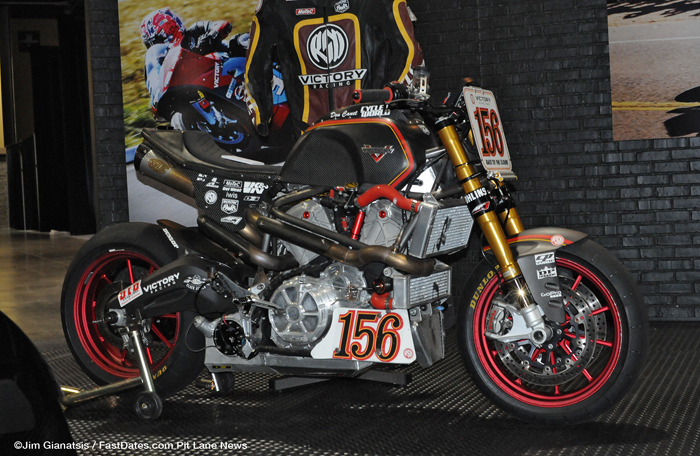 On display at Indian / Victory Motorcycles was the race bike they commission Roland Sands to build for them to race at Pikes Peak in the hands of motojournalist Don Canet from Cycle World who crashed out. It was announced at the Show this high output 100cc V-Twin motor would be going into production, but we will have to wait a little longer to find out why type of sport or hooligan motorcycle chassis it will be featured in.